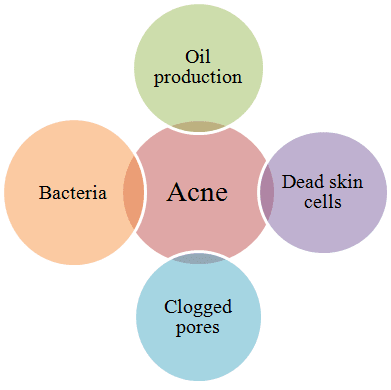 Acne is a common skin problem which starts when oil and dead skin cells clog up the pores of your skin. People also call acne as blackheads, whiteheads, pimples, comedones or zits. A comedo, or basic acne lesion, is a hair follicle that has become clogged with oil and dead skin cells. Acne is a very common skin problem in teenagers. Blackheads are open at the surface of the skin. They are filled with excess oil and dead skin cells. The black hue of black heads result from the irregular reflection of light coming from clogged hair follicles. Whiteheads are closed at the surface of the skin. 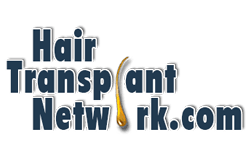 Whiteheads occur when oil and skin cells prevent a clogged hair follicle from opening. Papules are inflamed, small red or pink bumps on the skin. Picking or squeezing can make the inflammation worse and may lead to scarring. A large number of papules may indicate the moderate to severe acne. Pustules are also type of inflamed pimple. They resemble a whitehead with a red ring around the bump. Bump is filled with white or yellow pus. Avoid picking or squeezing pustules. Picking can cause scars or dark spots to develop on the skin. 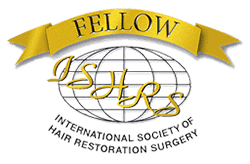 Hair follicles are connected to oil glands. These glands secrete an oily substance known as sebum to lubricate your hair and skin. When your body produces an excess amount of sebum and dead skin cells, they together form a soft plug, creating an environment where bacteria can thrive. If the clogged pore becomes infected with bacteria, inflammation results. The plugged pore causes the follicle wall produce a whitehead. When whitehead is exposed to air, it turns into blackhead. A blackhead may look like dirt stuck in pores. But actually the pore is congested with bacteria and oil, which turns brown when it’s exposed to the air. When bacteria attacks on the exposed area of your skin, pore become inflamed or infected and produces a bump which is acne. What are the Natural acne treatments? 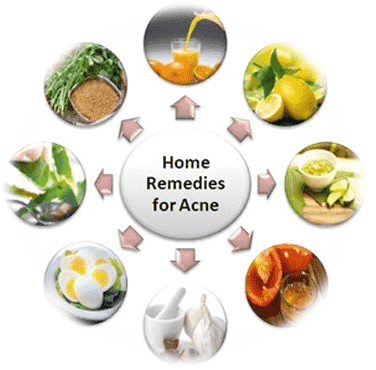 Some natural or medicinal plants can be used to treat acne. Herbal medicines are gaining popularity due to their advantages. They are less expensive and exhibit less side effects. Nowadays, medicinal plants are formulated with synthetic compounds for various uses. Neem helps to draw extra oil & toxins from your skin. It helps to balance the skin moisture levels and fights with fungal or bacterial infections causing acne. 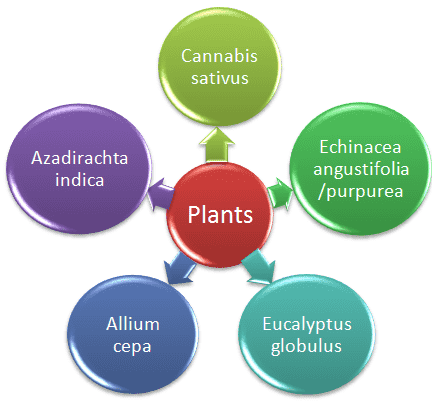 Cannabis sativus (Marijuana): Cannabis contains cannabinoids, which have healing properties and are great source of antioxidants. It exhibits anti-inflammatory properties making it ideal for preventing acne. Echinacea angustifolia & purpurea (cone flower/ purple cone flower): It helps to kill acne causing bacteria P.acnes. Echinacea is rich in tannins (works like astringent) and exert shrinking effect on skin cells. It soothes skin by reducing the swelling of skin tissues. Eucalyptus globules (Nilgiri/ Blue Gum Tree): Eucalyptus possesses antibacterial action & shows ability to inhibit the action of sebaceous glands. It contains monoterpene (gamma terpinene) which acts on the acne causing bacteria P.acnes and on other broad range of bacteria. Allium cepa (Onion): It helps to reduce the inflammation on the skin and discoloration of the scars due to acne. Coping Acne or pimples with Home Remedies! Acne is the most common problem which everyone face in daily life. Before going for chemical treatments or procedures, always use home remedies to remove acne or acne scars. Oranges: Oranges are the good source of vitamin C. Drink orange juice and don’t throw away the peel! Orange peel is very good for acne. Lemon Lemon is the most common ingredient in our home. Fresh lemon can be used to treat several things and acne also. You can use different home remedies with lemon to treat acne/pimple or acne scars. Cucumber: Cucumber gives a soothing and refreshing effect on your skin. You can treat acne or pimple easily with cucumber. It helps to make your skin feel & look young. Crush cucumber into a paste and apply it on the affected area. Leave it for almost 30-40 minutes and wash with fresh water. Tomato: Tomato is also a good source of vitamin C. Tomato helps to treat blackheads and cleans or opens the pores. If you have oily skin, then this home remedy for acne is best for you. Garlic: Garlic has healing properties. Allicin in garlic exhibits anti-inflammatory property. Treating acne with garlic is very easy. Garlic is effective in even chronic forms of acne. You can repeat this remedy for 3-4 times. How to get rid of pimple or acne overnight? Wash your face with fresh water and you will notice the dried pimple. Potato is rich in vitamin C. It will help to dry acne and even in acne removing. Take a peeled potato and mesh it properly. It will help to maintain the pH of the skin and kills the bacteria. Baking soda is the most powerful agent used to get rid of acne overnight. Tea tree oil helps to reduce sebum and opens the blocked pores and kills the acne causing bacteria. Sometimes acne or pimples leave marks on the skin which is another cause for concern. You can use home remedies to treat acne scars which effectively removes scar. Coconut oil contains natural vitamin E. Fats in the coconut oil helps to maintain skin supple, fights aging and also moisturize the skin. Coconut oil contains recuperating properties and is best for lightening and removal of scars. Rub mildly on the scar and let it absorb properly. You can leave it overnight as coconut oil is natural and will increase the health benefits. However, if you don’t want oil on your face for much time, you can wash face with mild face wash.
Sugar scrub also works great to remove scars of acne. Take 3 teaspoon full of sugar and 2 teaspoon of olive oil mix it properly. Mix 2 teaspoons of rose water and 1 teaspoon of glycerin. Apply it to the scar and you can also massage in a circular motion. Leave it 15 minutes and wash your face. Take 2 tsp of turmeric powder and 2 tsp of milk. Mix it well and apply it all over your face or even affected area. Leave it for 20 minutes & wash your face. Take 3 teaspoons of lemon juice and add 3 drops of glycerin to it. 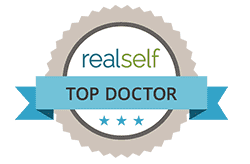 How to treat acne with chemical treatments? 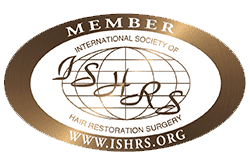 The only β-hydroxy acid that is used in dermatological practice. It promotes natural exfoliation, and exerts moderate comedolytic activity (inhibition of acne formation). 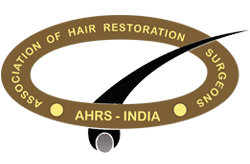 It is an effective topical agent since many years and is available in different formulations (washes, lotions, creams, and gels) and concentrations. It helps in thinning of stratum corneum and promotes epidermolysis (loosening of the epidermis), dispersing basal layer melanin, and increasing collagen synthesis within the dermis. 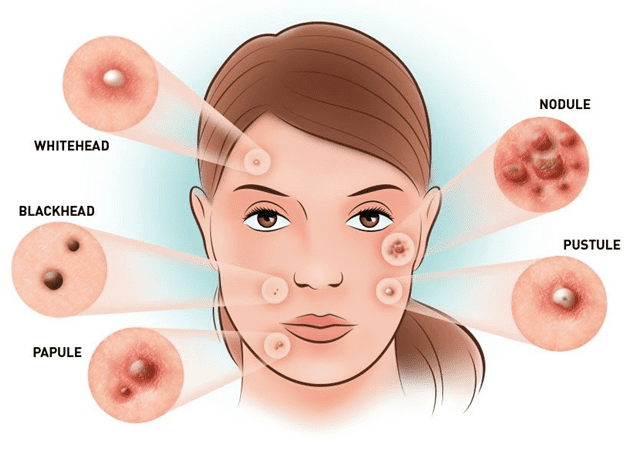 What are the foods that cause acne? Diet plays a major role in acne formation. There are several foods that triggers acne. 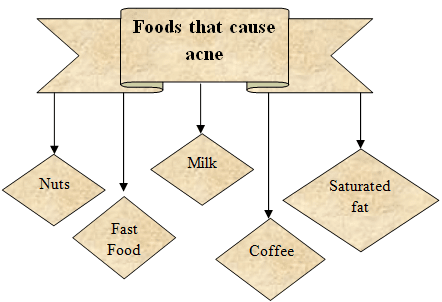 People often think that what foods cause acne! Avoid high glycmein content food. These will rise the insulin levels in the body which will secrete more androgen hormones. This will further lead to oil or sebum production and chances of infections also increases. Your skin will be more prone to acne. What are the best acne medications I can use? Try to choose medications which include Benzoyl peroxide, Salicylic acid. These will help to exfoliate your skin and treat acne. You can go for topicals which includes clindamycin, isotretinoin. 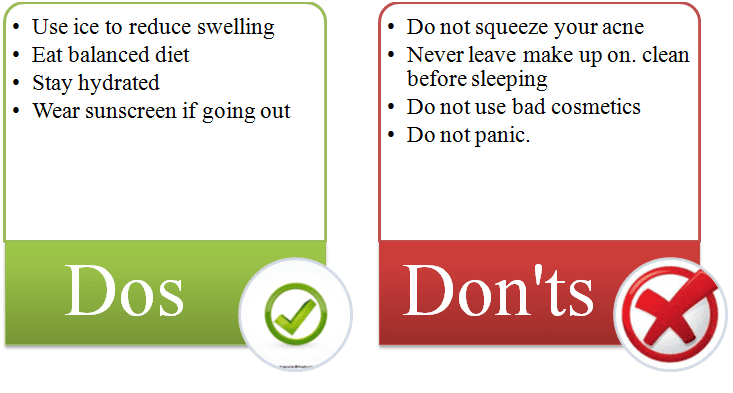 Before using consult with doctor if you have any allergy. Yes. Milk can cause acne as it has tendency to enter our blood stream. This will rise the insulin level or glycemic levels in the body and promotes inflammation or increases oil production which will lead to acne. Chocolate increases the production of inflammatory markers (interleukin-1b) which lowers the body’s defense mechanism against bacterial infection. Our body gets more prone to infections. So higher levels could allow bacteria to form acne or even worsen them. Smoking provokes the important alterations on the skin microcirculation, on keratinocytes and on the collagen and elastin synthesis. These alterations can results in pore opening of your skin and dirt or oil can accumulate in your pores. This may lead to acne formation.